Tangerines are technically mandarin oranges -- small, easily peeled oranges with sweet fruit. Reddish varieties such as "Clementine" are often marketed as tangerines but are not significantly different from other mandarins. Like most other citrus fruits, tangerine trees are usually self-fertile. However, some varieties are self-sterile and require another tree to pollinate them. Citrus trees naturally have perfect flowers. A “perfect” flower is one with both male and female organs on the same blossom. The tree can pollinate itself even if no insects or other trees are available. Despite this, most tangerine and orange farmers use bees to pollinate their crops. Cross-pollinated tangerines usually produce more and larger fruit than trees left to pollinate themselves. According to the University of Florida, some varieties of mandarin produce almost no fruit unless growers use a pollenizer. Most tangerines are pollinated by honeybees. Beekeepers place their hives near citrus groves to produce orange blossom honey. The bees carry pollen from the flowers of one tree to another, ensuring cross-pollination and good crops. Using insect pollinators is less expensive and labor-intensive than pollinating the trees by hand, though it produces less predictable results. Tangerine trees may produce more or less fruit, depending on which pollen the bees carry to their flowers. 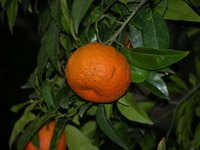 Some tangerine hybrids are self-sterile and cannot pollinate themselves. These trees require cross-pollination by another compatible citrus tree to produce fruit. Self-sterile varieties include Robinson, Sunburst, and the Minneola and Orlando tangerine-grapefruit crosses. According to the University of Florida, the tangerine-orange cross Temple is a good pollenizer for these tangerine varieties. Seedless tangerine varieties produce few to no seeds, making them easier to eat. However, they lose their desirable seedless characteristics when cross-pollinated by another citrus tree. Seedless tangerine growers may need to cover their crops while bees are pollinating other citrus varieties or may need to keep bees away from the trees entirely.